We’ve used the NSPCC’s Letter’s From Santa in previous years so I was thrilled to be asked to get involved this year to help spread the word and keep the magic of Santa alive. I provided the NSPCC with information about my son Zak including hobbies, achievements, friends and siblings and then the wonderful people at NSPCC worked their super Santa magic to produce an incredible response to Zak’s information provided. I’ve actually been a bit sneaky and e-mailed this to Zak as if it’s from Santa’s elves! I can’t wait to see his face when he reads it. 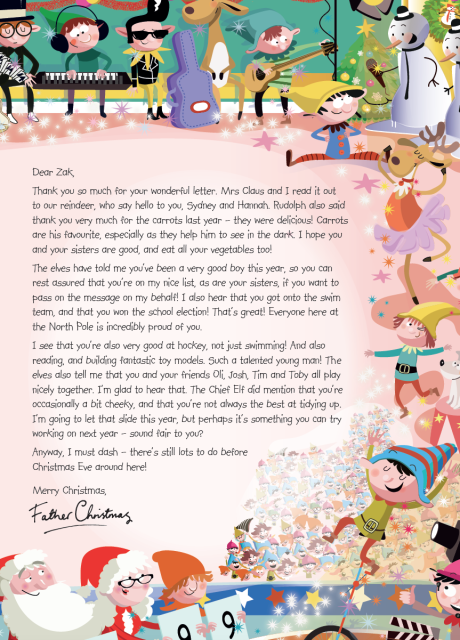 You’ve still got time to create a magical letter for your own children and print out ahead of Christmas, visit Letters From Santa for more details. I wish that I had read this prior to Christmas. I think this year is going to be the last one that my eldest daughter “believes”. I hope that they do it next year, as my youngest would love this. Donna @ Little Lilypad Co recently posted..How to recycle …. the Santa way. This is such a great idea and for a very good cause.